Cones alone are not enough! Enhance the safety of your workers and surrounding areas with the Robolight™ ConeLights™. Robolight™ ConeLights™ are small, versatile and more effective than using cones by themselves. 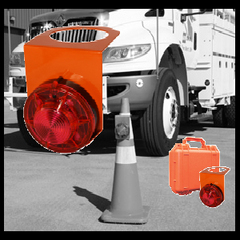 Providing a safer alternative, ConeLights™ can be easily placed over your cones. ConeLights™ ultilize durable long lasting weather resistant LEDs. 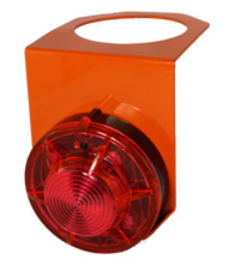 Lights are attached (superior magnets) to rust proof powder coated orange steel plates that can be used with all cone sizes. Because of the superior duty magnets, ConeLights™ have numerous other uses.